In stock -This product will ship today if ordered within the next 1 hours and 44 minutes. Vegepa provides a combination of pure EPA omega-3 from 70% concentration wild anchovy fish oil and omega-6 GLA from cold-pressed virgin evening primrose oil, with vitamin E for extra protection of the oils. Vegepa balances and maintains healthy omega-3 and omega-6 levels and is a highly effective all-round supplement that offers medium intensity nutrition support, ideal for general wellbeing maintenance. Vegepa is a rich source of polyunsaturated fat. Vegepa is also a source of vitamin E, which contributes to the protection of cells from oxidative stress. Capsule shell (emulsifiers: fish gelatine, vegetable glycerol); ethyl-EPA (eicosapentaenoic acid) concentrate from wild anchovy fish oil; cold-pressed virgin evening primrose oil; antioxidant: vitamin E.
Adults and children aged 12 years and over: 2-4 capsules daily. For intensive support: up to 8 capsules daily. Children 4 to 11 years: 1 capsule daily. It is not advisable to exceed the above dose unless advised by a healthcare practitioner. Take Vegepa with food for optimum absorption. If taking any medication, seek professional medical advice before taking this product. If you are taking any medication that thins blood, do not take this product without prior medical advice. Pregnant or lactating women should consult their doctor before taking any food supplement. Below are reviews of Igennus Vegepa Omega 3 and Omega 6 - 60 Capsules by bodykind customers. If you have tried this product we'd love to hear what you think so please leave a review. When I first started taking these they really improved my concentration now I won't risk stopping. Top brand for omega oils. I attended a talk many years ago by a Prof. Puri, via his research of MRI scans on CFS/ME patients, he had seen evidence that taking these oils could help with some symptoms. This product is purer than many on the market and for that reason alone, i dont mind paying a bit extra for a better quality product. Highly recommend. Great product, good service, but too pricey! Been using these for several years after a friend recommended them. Great for concentration and memory. Also feel calmer. Excellent product for mood and joint problems. If you need omega 3 this is by far the best. These are a mainstay with me. Lovely story, the owner of the company, a businessman, founded it because his daughter had heart problems and he wanted to pare down on the big pharma issue. They are the best omegas on the market, great for comprehensive wellbeing, take them for psychological heath and brain power! Very good fish oil with just EPA which is especially good for mood and joint aches. I took the EPA restore first for two months and have now gone on to this for maintenance. Highly recommend this fish oil. Been taking these fish oils for 5-6 weeks now for fibromyalgia & I have noticed my aching as lessened significantly & I'm feeling a lot better than I was on the prescription medication for fibromyalgia. I have been taking 4 on a morning & 4 on an evening & I'm feeling better everyday. I have suffered with fibromyalgia for over 10 years now & wish I had known about these years ago as I'm getting some relief at last. I also take vit d3 & 2 magnesium malate which help a lot. I love Igennus products, I've been taking Vegepa capsules for a while and noticed a big difference in my concentration levels. One of the best fish oils in my opinion. 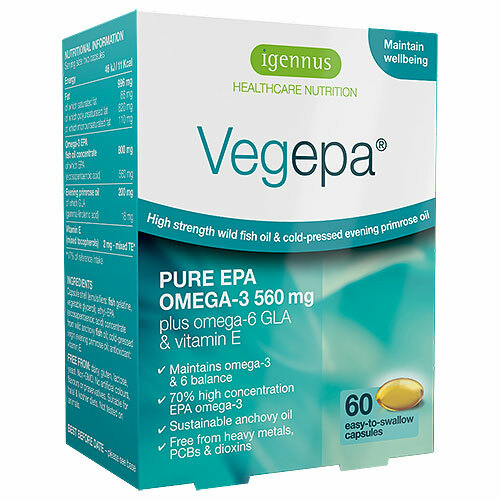 Vegepa provides a combination of pure EPA omega-3 from 70% concentration wild anchovy fish oil and omega-6 GLA from cold-pressed virgin evening primrose oil, with vitamin E for extra protection of the oils.